Nova Scotia Environment Minister Margaret Miller said Thursday she's pleased with the progress of the Tufts Cove oil spill cleanup and the province won't be actively investigating the cause. 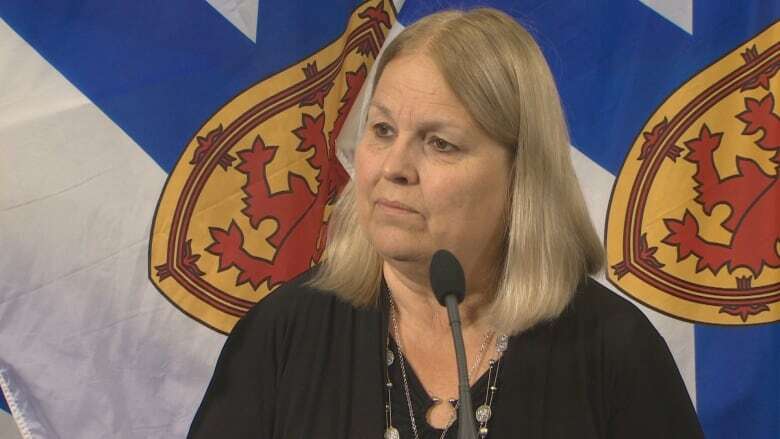 Nova Scotia Environment Minister Margaret Miller said Thursday she's pleased with the progress of the Tufts Cove oil spill cleanup and any investigation into the cause will be left up to the province's electric utility. 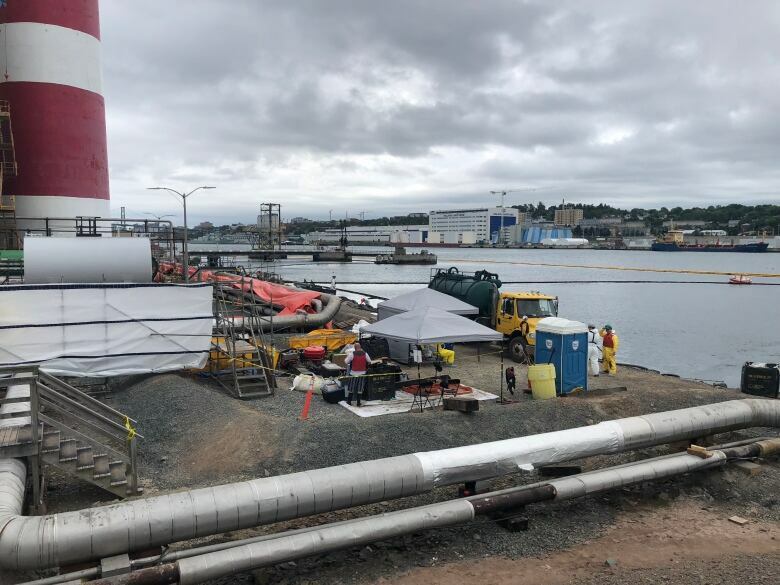 A leaking pipe at the Nova Scotia Power generating station Aug. 2 spilled about 5,000 litres of bunker C fuel into Halifax harbour. Nearly two weeks later, the utility announced an additional 9,900 litres had leaked into a containment trench and another 9,400 litres entered the cooling water system of one of its generators. "Certainly it is concerning that it was that much of a spill," Miller told reporters Thursday. "I am really happy that it was contained and that ... the company was able to make sure that the spill didn't spread any further." She said she'd had no recent updates on the progress of the remediation work, which is expected to continue until mid-September. Bunker C fuel oil is the most sticky and thick of the residual fuels and is typically used by ships, industrial boilers and power generating stations. The Environment Department has no plans to investigate the state of the pipe at the time it burst or why it had deteriorated, Miller said. "Our department makes sure about the remediation of the site so we're not going to be looking at the mechanics of the facility itself," she said. "Those would be business decisions of the company, they know what they risk if their equipment isn't up to par. Our main rule is to make sure that the site is remediated." Miller said she was also satisfied that Nova Scotia Power released information about the spill to the province in a timely fashion. "We were told as soon as it was confirmed the amounts of the spill. We were given the information at the same time it was made public," she said. But spills involved bunker C fuel oil are more than just a business risk, said Clean Arctic Alliance, a group of non-profit organizations pushing for a ban on heavy fuel oil in northern waters. Its thick, viscous and toxic properties make it particularly harmful to marine birds and shorelines. The Ecology Action Centre in Halifax said last week it has been concerned about the use of the bunker C oil at Tufts Cove for some time. In a release, the Clean Arctic Alliance pointed out cruise ships that regularly visit Halifax harbour, such as Holland America and Carnival, still use the heavy oil. The group said it is concerned about fuel oil spills by the cruise ships, especially cruise tourism to Arctic destinations where a heavy fuel spill would be disastrous to the fragile marine environment. The MS Rotterdam, which uses bunker C fuel, just finished a cruise that included Norway, Iceland, Greenland and Labrador, and was in Halifax harbour Thursday. Tiffany Chase, a spokesperson for Nova Scotia Power, said the company is investigating the cause of the spill and how long the oil was leaking. She did not have a timeline for when the investigation would be complete or say if a report would be released publicly. Earlier this month, the utility said a hole the size of the tip of a thumb developed in a pipeline that carries oil between an on-site tank and the plant. Crews have recovered a dead seagull, pigeon and a dozen small crabs, Chase said. Two cormorants were taken to the wildlife rehabilitation centre Hope For Wildlife but have since died, she said. "We continue to diligently monitor for the presence of wildlife and mammals, and we are using noisemakers where required to shoo them away from the area that remains impacted in front of the plant," said Chase.